Responsible for the design of this ves- sel series is Seattle-based naval architec- tural firm Guido Perla & Associates (GPA). who took the responsibility for regulatory compliance by entering plans to ABS for U.S. and International Ton- nage Certificates. The firm's engineers worked to perform the structural and mechanical calculations, electronic load analysis, and short circuit analysis and drew up a fire and safety plan. GPA engineers also created composite draw- ings with machinery and wiring layouts and piping routing for the equipment, ensuring that construction and opera- tional maintainability was free of inter- ference. 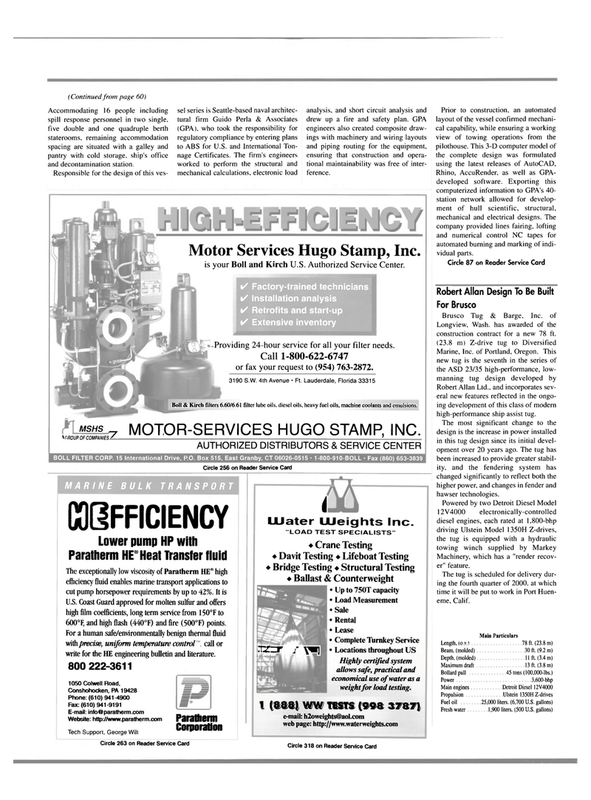 Motor Services Hugo Stamp, Inc. is your Boll and Kirch U.S. Authorized Service Center. • Factory-trained technicians • Installation analysis • Retrofits and start-up • Extensive inventory -Providing 24-hour service for all your filter needs. Boll & Kirch filters 6.60/6.61 filter lube oils, diesel oils, heavy fuel oils, machine coolants and emulsions. U.S. Coast Guard approved for molten sulfur and offers high film coefficients, long term service from 150°F to 600°F, and high flash (440°F) and fire (500°F) points. Rhino, AccuRender, as well as GPA- developed software. Exporting this computerized information to GPA's 40- station network allowed for develop- ment of hull scientific, structural, mechanical and electrical designs. The company provided lines fairing, lofting and numerical control NC tapes for automated burning and marking of indi- vidual parts. Robert Allan Ltd.. and incorporates sev- eral new features reflected in the ongo- ing development of this class of modern high-performance ship assist tug. The most significant change to the design is the increase in power installed in this tug design since its initial devel- opment over 20 years ago. The tug has been increased to provide greater stabil- ity, and the tendering system has changed significantly to reflect both the higher power, and changes in fender and hawser technologies. Machinery, which has a "render recov- er" feature. The tug is scheduled for delivery dur- ing the fourth quarter of 2000. at which time it will be put to work in Port Huen- eme, Calif.